Britain's Parliament observed a minute of silence to remember a police officer and two civilians killed a day earlier in an attack at the heart of London. 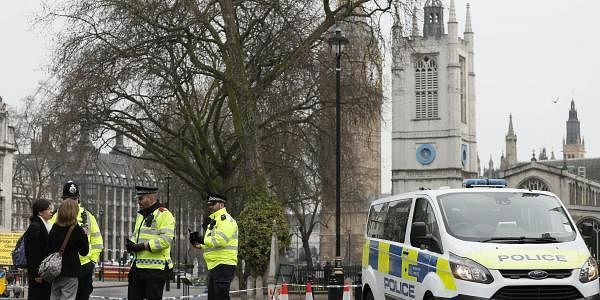 LONDON: Britain's Parliament observed a minute of silence Thursday to remember a police officer and two civilians killed a day earlier in an attack at the heart of London, while authorities raided homes in central England to search for evidence. Eight people were arrested in raids, including some in the city of Birmingham. Police searched for clues as to why a man driving an SUV ploughed into pedestrians on Westminster Bridge, killing two and injuring more than 30 others, before he fatally stabbed a police officer on Parliament's grounds. Police shot and killed the attacker, whose identity they have not yet disclosed. Parliament was locked down after the attack, and the return to business was seen as an important act of defiance. The silence began at 9:33 a.m., to honour the shoulder number of the murdered officer, Keith Palmer. "Those who carry out such wicked and depraved acts as we saw yesterday can never triumph in our country and we must ensure it is not violence, hatred or division but decency and tolerance that prevails in our country," Trade Secretary Liam Fox said. The other lawmakers responded: "Hear, hear!" Mayor Sadiq Khan called for Londoners to attend a candlelit vigil at Trafalgar Square on Thursday evening in solidarity with the victims and their families and to show that London remains united. London went on. Parliament Square, Westminster Bridge and several surrounding streets remain cordoned off by police. Scores of unarmed officers in bright yellow jackets were staffing the perimeter tape, guiding confused civil servants trying to get to work. In Parliament's New Palace Yard, a blue police tent was erected over the spot where the stabbing and shooting occurred, and two forensic officers worked at a trestle table nearby. Metropolitan Police counterterrorism chief Mark Rowley said that he believed the attacker acted alone and was "inspired by international terrorism." The attacker has been identified and was known to British security, according to a security official who spoke on condition of anonymity because he was not authorised to speak about ongoing security operations. He declined to name the man and to give any other details about his identity, nationality or hometown. Rowley revised the death toll from five to four, including the attacker, the police officer and two civilians. He said that 29 people required hospitalisation and seven of them were in critical condition. He also said that authorities were still working out the number of "walking wounded." Police had previously given the total number of injured as around 40. One of those killed was Aysha Frade, a British national whose mother is Spanish, the Spanish Foreign Ministry said. Before Rowley's news conference, British media reported that armed police carried out a raid on a property in Birmingham. The Press Association on Thursday quoted an unnamed witness saying that the operation was linked to the attack. The witness said that police raided an apartment and arrested three men. Police in the West Midlands, where Birmingham is located, directed inquiries about the operation to London's Metropolitan Police. Defense Secretary Michael Fallon told the BBC that authorities assume the attack was linked to "Islamic terrorism in some form." Investigators worked around the clock. "They have been working right through the night, looking into his background, how he got hold of the vehicle, where the vehicle has been in the last day or two, and who may or may not have helped him," he said. Speaking outside 10 Downing St. after chairing a meeting of government's emergency committee, COBRA, Prime Minister Theresa May said Wednesday that level wouldn't change. She said attempts to defeat British values of democracy and freedom through terrorism would fail. Londoners and visitors "will all move forward together, never giving in to terror and never allowing the voices of hate and evil to drive us apart," May said. President Donald Trump was among world leaders offering condolences.